Spotlight on my new favourite workout! I first discovered Ballet Beautiful about a year and a half ago. I have danced on and off since the age of four, cumulatively totalling about seventeen years as a dancer. I’ve studied ballet, variations of jazz, variations of hip hop, pointe, contemporary, modern, lyrical, highland and hula. My favourite has always been ballet. I consider myself quite lucky to have found something I love which has the added value of increased physical, mental and emotional health. While I would love to be able to dance every single day at $14-18 per class I needed to find a more cost efficient physical activity to supplement my dance classes. 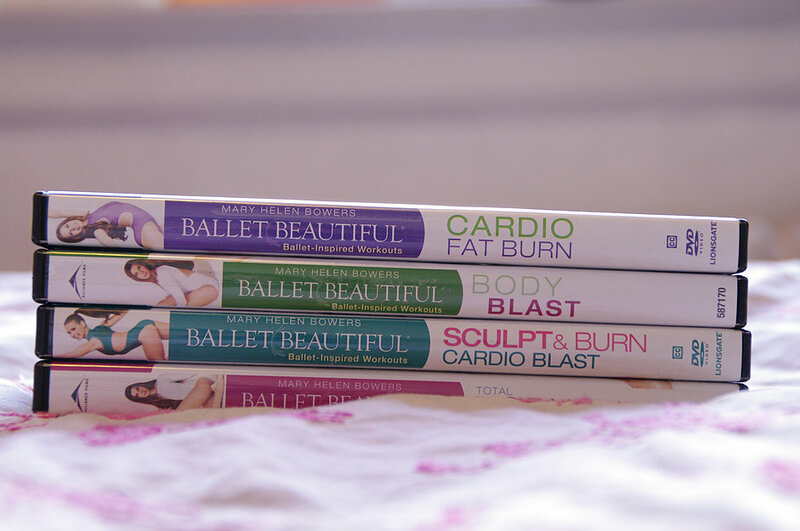 I was excited to find Ballet Beautiful, as it is the ideal cross training for a dancer. Built on classical ballet positions and using the same muscles in the same way, the method will give you the musculature, flexibility and posture of a dancer, without requiring a studio! Despite the ballet aspect of the workout, you do not need to be trained as a dancer to benefit from the method. You will, however notice your body assuming the physique of a dancer, long, lean muscles, improved posture as well as grace. The founder, Mary Helen Bowers who danced for ten years with the New York City Ballet, offers instruction over a multitude of platforms. One can purchase DVDs, stream videos, take live classes over the internet and even schedule in-class sessions at Mary Helen’s Soho studio in NYC. Thus far I have relied solely on four of her DVDs, though one day I would love to visit her studio for a class in person. Each DVD is one hour in length, which is what I like to commit to a daily workout. However, some of her DVDs are designed to be broken into 15, or 30 minute sessions if you are shorter on time. I find this works well when you are beginning the Ballet Beautiful method. The first workout I attempted was the “Swan Arms”, a fifteen minute arm workout on the Body Blast DVD. It was so difficult I actually couldn’t complete the entire workout, which is broken into four sets of eight reps for each exercise. I found a few videos of hers on the Net-a-Porter YouTube channel, about five minutes each. I actually began with just five minutes the first day, and added another five minutes each day, eventually working up to a full hour. Honestly, when I began her method I would not have been able to complete a full hour with correct form, this is how hard she will make you work, but the results are well worth it. While the workouts are quite gruelling, you see results immediately. I found my posture improved immediately after my first workout. I began seeing results in the shape of my legs and hips after a couple of weeks. After about a month I began seeing incredible improvement in my dancing, which I never would have seen as quickly if I was sticking to my three classes a week. I really appreciate the overall aesthetic of the Ballet Beautiful workouts. The DVD menu allows the option to workout with, or without Mary Helen’s instruction. I always chose with, because she counts, like a metronome, allowing my mind drift a bit and I can look away from the screen, while maintaining correct time. I often think of at-home workout DVDs as those tacky videos, popular in the eighties, with over-enthusiastic instructors yelling inspiration and tough-love at you from the television. 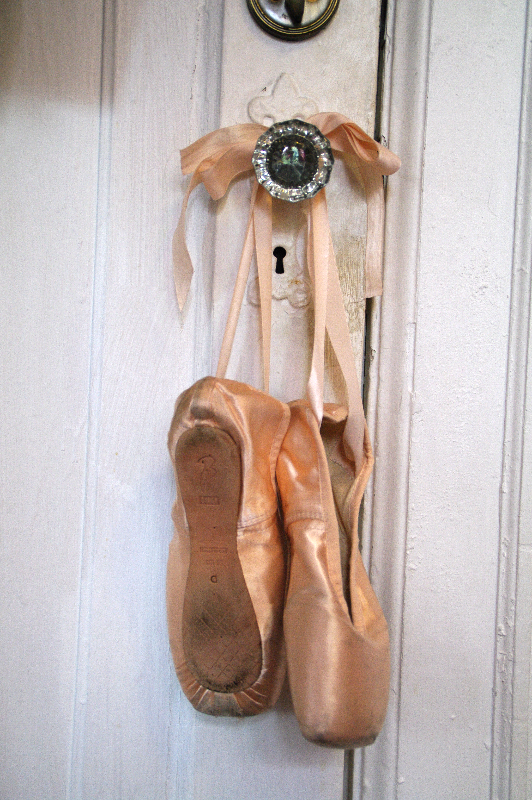 Ballet Beautiful is nothing like that. The background is Mary Helen’s simple and delicate white studio, decorated with a few ferns, or with the drawn curtains, emiting the NYC skyline. Classical music plays softly in the background, over which Mary Helen counts reps. She may throw in a little prompt to maintain your posture, be aware of your core, or that the work out is almost over, but she’s not over the top. Mary Helen’s knowledge of the body is evident in her method. She encourages stretching between workouts and always leaves time at the end for a lengthy full body stretch. She emphasizes the importance of stretching to receive the best results from a workout. Not only does stretching improve flexibility, it prevents injury and decreases muscle stiffness and soreness following a workout. I feel very little soreness the day following a Ballet Beautiful workout, which is saying a lot, considering the difficulty of the workouts! My favourite aspect of the Ballet Beautiful method is the portability of the workouts. All you need is a computer. For some workouts you might want to have a yoga mat, but I usually lay a towel on the floor if I find my knees, or spine irritated by the hardwood. I also find it works best to have ballet slippers, as socks can be too slippery for some positions, while bare feet can stick to much for others. The suede soles of ballet slippers are designed to give you enough traction on your supporting foot, while providing a smooth surface for sliding foot movements, such as tendus and jetés. In terms of space, very little is required for the workouts. I do them in my bedroom, which has very little standing space. All you really need is enough room to stretch your arms. I love this about these workouts, as it means I can continue my workout routine while travelling! To conclude this post I’m leaving my own experience with each of the DVDs I’ve tried. Each person is at their own level and journey in their workout, has their own strengths and weaknesses. As such, each individual experience is going to be different. I’ve tried to be as objective as possible, but keep this in mind while reading, your experience is likely to differ from my own. I recall Mary Helen referring to this DVD as her favourite, which I can understand. It has a mix of everything: cardio, strength and toning and targets all the major muscle groups used in dance. The workouts are a bit more sustainable as there are six of them and thus much shorter than her other DVDs making them less gruelling than the Body Blast. The Body Blast is divided into four 15 minute workouts, which can be done separately, or together if you wish. 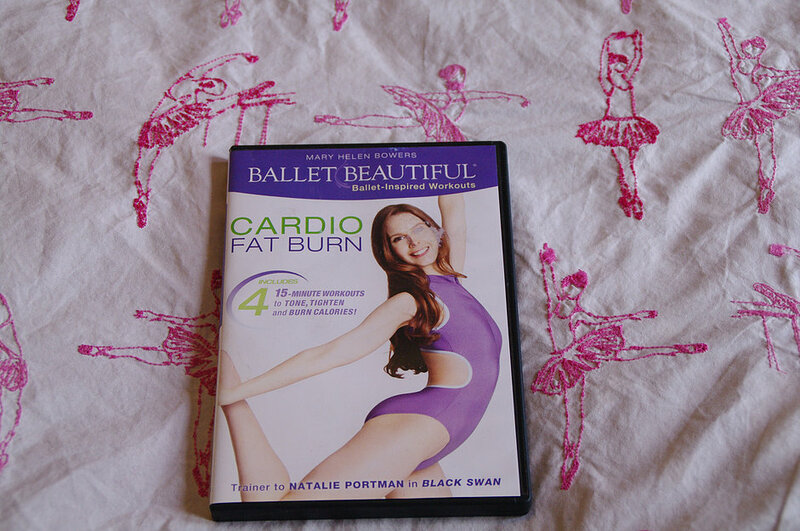 I personally find this DVD the most difficult of all the Ballet Beautiful DVDs I own. It is entirely anaerobic work, which leaves muscles exhausted as the cells aren’t breathing. The thing about these strength exercises though, is you improve every single time you do them. Your muscles become stronger and your ability to complete the work out improves. I remind myself every time I do this DVD, “It won’t be as bad as the last time”! This happens to be my favourite of the DVDs, probably because it has the longest stretch of all her workouts, my personal favourite section of any workout. The Cardio Fat Burn includes intervals of cardio and strength, which I happen to like as it switches up just when you think you can’t go on. It is the most cardio-intense of her DVDs and requires quite a bit of jumping, which for the most part I don’t mind, other than worrying about disturbing others who may live below, or next to you if you live in a small apartment with roommates. Mary Helen refers to this DVD in particular as her travel workout, though frankly I find all of the DVDs equally as portable as this one. As a matter of fact, I find that claim a little ironic, as it’s the only workout requiring equipment. The second half, of the first workout requires weights. If I’m being perfectly honest, I actually don’t use the weights because I don’t like equipment. The DVD is split into two 30 minute workouts, for toning and cardio. I personally find the first 30 minutes easier as it has more of a focus on cardio, which I excel in. The second half focuses on abdominals, a bridge series, an outer thigh portion which is enough to make you feel as though your legs have gone numb and a short arm section.